Hey guys. I have created a script for FileBot that downloads missing subtitles and you don't even realize. * It will check your main tv series folder every desired interval and downloads missing subtitles. * You can add Folder Watch from right click and create a task for checking subtitles maybe for a movie. * You can manually download subtitle for your .mkv .avi .mp4 files via context menu. Tested on Windows 7 and Windows 8. You need Administrator account for this script. And also it is using opensubtitles for downloading subtitles. If there isn't any subtitle on the OS database you can't download. You may ask is it only Turkish and English, it is not. Turkish and English languages are only for the installation stage and for the context menu. But you can download any languages. There is also context menu for Recycle Bin. I don't know how to remove it from there. Mark file as watched; NEW FEATURE!!! ADDED- Mark file as watched for your video files! I tested on Windows10 where u need Administrator account for this script. SubDownloader is a lightweight program to naturally download/transfer captions for video records. It gives a spotless interface which gives you a chance to discover coordinating captions for your films in only a couple of steps. 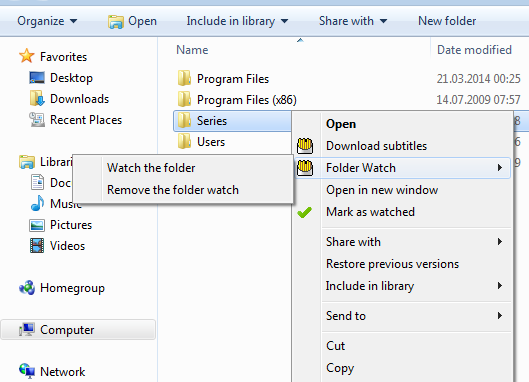 * You can add Folder Watch from right click and create a task to buyessays for checking subtitles maybe for a movie. Thanks for the tool. Have you mentioned in on Filebot forums as well? You may also add it to the Alternativo website. What are the compatibility options with other third party tools?